I’m continuing my series about the upcoming stage musical The Great American Mousical today with a look at the book the musical is based on, and how much one can learn about theatre simply by reading (and re-reading!) 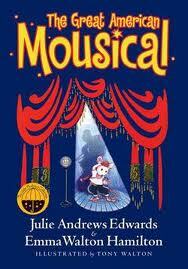 the book by Julie Andrews and Emma Walton Hamilton, also entitled The Great American Mousical. As Julie said in my interview with her and Emma last week, “We wrote the book as an affectionate tribute to the world we know and love – but we also hoped to provide young readers with some incidental arts appreciation.” I think they did a very good job of both. The Great American Mousical is a middle grade novel published by HarperCollins in 2006 as part of the Julie Andrews Collection of books that seek to instill the JAC tenets of “Words, Wisdom, Wonder” in young readers. It is about a troupe of theatre mice who work in a miniature theatre in the depths of the basement below a Broadway theatre, the Sovereign. The mice are readying themselves for their annual benefit revue to be staged on New Year’s Eve when calamity strikes — they learn that the Sovereign is under threat of demolition. Then the star of the show, the diva Adelaide, goes missing! The show goes on, as shows must — but much has to happen before a happy ending can be possible. Harold is a delightful character, who often falls back on lines from Shakespeare to express himself — it would be great for families reading this story together to try to find where these quotes are from. For the keen reader, there are many references to real Broadway musicals hidden within the story. The songs that the mice perform are mouse-ified tips-of-the-hat to songs from Fiddler on the Roof, My Fair Lady, Annie and many others. The characters’ names are also nods to musical theatre, as the names are taken from various productions as well. I first suspected this when I recognized the name of the Comedian, “Curly”. That is the name of one of the lead characters in Oklahoma! Then I recognized “Mrs. Anna,” the Wardrobe Mistress, named after the female lead in The King and I. Later, I learned that all the character names can be traced back to some Broadway production. I have had a wonderful time discovering where other character names originated. Julie and Emma must have had such fun putting in these references! There are concrete lessons in stagecraft, as well. We see this both through Emma’s and Julie’s words, and through Tony Walton’s illustrations. So many aspects of mounting a show are depicted — the chaos backstage during the dress rehearsal; the director and stage manager sitting at their table in the audience area, calling lighting cues, scene changes; the challenge of getting the sets and scenery ready in time, and more. Everything that goes into getting a musical up and running is before our eyes, but is so skillfully woven into the telling of the story that we simply absorb it without noticing that we are learning things along the way. The paperback version of the book (sadly out of print) includes a number of “extras” at the back, including “Miss Addie’s Advice for Theatre Mice” which is quite a thorough compendium of tips about theatre for all aspiring actors, young and old alike. Alas, it is the hardcover version, which doesn’t include these extras, which is the version I was able to obtain for the giveaway. To supplement all that is within the covers of the book, there is an excellent section of Theatre Information and Resources on the Julie Andrews Collection website. The “Mousical Trivia Games” included therein highlight the sorts of references I’ve mentioned in this post, in a way that is fun for kids (and adults). “Miss Addie’s Advice for Theatre Mice” is also included. Hovering your computer’s cursor over the word “Wonder” in the menu bar on the JAC website will give a drop-down menu that leads to coloring pages and more. I urge you to find a copy of The Great American Mousical and experience this master class (or is it a MOUSEter class?) for yourself. Or perhaps you’ll win one in the giveaway! (details below). TICKET INFORMATION for the stage production: The Great American Mousical will be on stage at the Norma Terris Theatre, Chester, Connecticut, from November 8 to December 2, 2012. Tickets may be purchased by phoning the Box Office, 1-860-873-8668. You’re definitely in the draw, Erik. Every time you comment you get an entry! A “Character Actor” is usually an older actor who doesn’t get the male lead roles anymore, but plays parts for older men, often funny, odd or unusual characters. Learned something new. Hadn’t realized the characters names came from a variety of musicals. I read the book years ago. Will need to read it again.